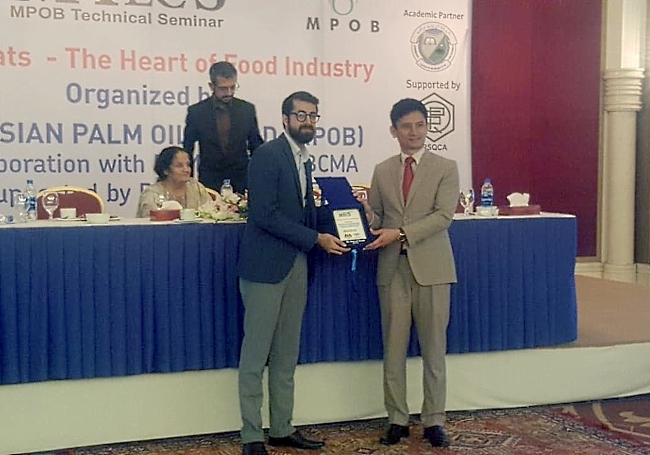 Mr. Nabeel Javed of SHADCHEM, official distributor in Pakistan of CDR FoodLab® and CDR PalmOilTester, presented a paper as well on Rapid Oils & Fats Analysis System for Quality Control. In this paper Mr. Javed presented CDR FoodLab® to all the known technical people of the industry as well as academia. Mr. Nabeel Javed is also a part of Sindh Food Authority, Pakistan Biscuits & Confectionery Manufacturer’s Association (PB&CMA). A details overview of the equipment and analysis system was presented with physical demo on the machine as well. A small booth was also presented on which physical machine, pipetting system and reagents were displayed for people to have a better idea. Different technical personnel took part in this seminar to overcome the lacking that they have at their ground level. The topics were chosen based on the sides that are weak these days in our market. Speakers from various industries, academic institutions, standard authorities and others presented their papers that highlighted the issues of Pakistan as well as how to bring betterment in the market. Nabeel Javed of Shadchem distributor of CDR FoodLab® in Pakistan receive a shield from His Excellency Mr. Khair-ul-Nazran Abdul Rahman, Consul General of Malaysia during the “MPOB Technical Seminar (MTecS) on Oils & Fats – The Heart of Food Industry”. CDR FoodLab® is the line of innovative products for quality control on food, it is part of the line also the CDR PalmOilTester the analyser dedicated to the quality control on Palm Oil. CDR PalmOilTester was also presented in 2015 to Malaysia Government Delegation headed by Kedah state Chief Minister, Datuk Seri Mukhriz Mahathir during their visit to CDR headquarters in Florence, Italy. CDR FoodLab® at Technical Seminar (MTecS) on Oils & Fats by Malaysian Palm Oil Board – 25th October 2018 in Karachi, Pakistan was last modified: November 15th, 2018 by CDR s.r.l.